This weekend will be fun. I hope everyone is on top of there training plan. Please remember that Saturday is your rest day. Please come to class well rested, and with a positive mental attitude. For the 50K group lets start earlier at the same location off ridge park at 6am, lets try to bust out 5ish miles before 7am. Then we'll meet up with the 25k group to run the 10 mile loop. Sounds good? good- I'll see Linda, Natasha, and Tom at 6am. and the rest of the peeps at 7am. How is everyone doing on their nutrition? What a great turn out on Father's day! Everyone did great! Our little fast rabbit was great leading the way again! Thank you Esteban. I hope you all liked the new way we went, and enjoyed the single track and down hill. That way is one of my favorite ways, by the way! I think most of you did well on your water. I think just a couple of you ran out. So good job on your nutrition, and water! It is getting hotter, so please bring water and electrolytes! I know I sound like a broken record, but it will be getting crucial as we are getting up in our miles this week. Some of you, and you know who you are...are wearing long sleeves! Please dress appropriately! Its getting hot people! :) It may be cool in the start, but it has been burning off quickly. So maybe try layers, and for sure sunscreen is a must now. These runs are your training runs to prepare you for race day. It is a mini race day. I have most of your applications. I still need from the Sherman's, Skip, Sue, Tony, Cynthia, Natasha, and Linda. I am going to wait one more week, and turn them all in on Monday the 28th! If you want to sign up on your own, that's fine, just remember we get 10$ off and then she will pull a raffle, and someone will be the lucky winner of a free entry!! O ya please bring your checks for the Bulldog applications will will be sending them in next week! The 4th week of training! I hope everyone had a great weekend! Well, we missed you and we had an "epic" weekend! Vikki, raced her first Ultra up in Big Bear with us, and did awesome! She even came in 3rd in her age group!! YAY!! I will let her share her experience with you. Pete and I also had a great run. It was an absolute beautiful day! The weather couldn't have been better, and just gorgeous! I hear most of you had a great run! Great job! I have posted on the calendar the training schedule as well in red, so you can see for the next month, what runs you should be getting in. I know some of you feel like you are falling behind, but don't worry, everyone has a bad week, and you can pick it right back up. Just do what you can. You can also start posting things on the calendar if you want to meet. I have some swims on there, and hope to see some of you at the lake tomorrow! By the way, Pete and I do coach Snails Pace in Laguna 3 times a week, please feel free to join our class Mondays and Wednesdays, at 6pm, or Saturday mornings at 7am! This weekend is Father's day weekend, and some of you may have plans. Just let us know if you plan on being there or not, and if we need to figure something out for you. And Last but not least, please feel free to call or email us at anytime for any questions or concerns. We will be meeting at El Moro on Sunday @7am- Click Here for directions-if you are new, when you get to the end of the street look for the baseball field on the right and park in the parking lot. There are restrooms and water at this spot. Both the 25k and 50k group will be doing the same 10 mile route, the route this weekend will be different from last week. For those that are familiar with El Moro, we will be going down "No Name" to the ranger station, then up "I think I Can" then continue on Boommer back to the cars. Skip will be our sub for this weekend. Both Corrinne and I have a 33 miler out in Big Bear on Sunday. Also Please check out our training calendar and join us for a swim this week. Please drop a note and tell us how your training is going... many of you had races last week. Also for you guys that want to get a good run in for tmr- you are more than welcome to join me at Snails Pace Laguna Hills, at 7am as we'll go out for a 7.534 mile run. I cant remember if I told everyone about our new calendar that Pete put on the website. It is on the right hand side and you have to click on the calendar words to make it pop up. Once you are in and want to see something that is posted, just click it and it should come up. If you want to add something to the calendar, just click the date, and an editing box should come up, and you just fill it in. Check it out, and lets have some fun! 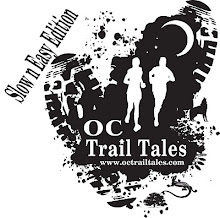 There is a local trail race at Peters Canyon this Thursday at 6:15pm you can register on site- on your training plan you have 5 miles to run anyway :) so come on out if you have the time, and look for our tent. Mountain Lions, Bobcats, and Snakes! For our racers that missed out, boy did you miss out on some fun and adventure, but mostly the wildlife was out this weekend, and i am not talking about Skip! :) We (well, some of us), saw a Mountain Lion, Bobcat, and a rattlesnake! I will let some of the Trail Talers fill you in next weekend, or you can respond to the blog. We certainly have a "tale" for our "Trail Tales" now though. Congratulations by the way to all of our racers that raced this weekend! I hope you don't mind, but i did post your times! Awesome job to all of you! You all Rock! We did miss you though. We had some busy weekend and our very own busy racers!! Here are the race results for the weekend!!! Congrats everyone! You all rocked it! Get ready to tear it up this weekend. We will be meeting at El Moro on Sunday @7am- Click Here for directions-if you are new, when you get to the end of the street look for the baseball field on the right and park in the parking lot. There are restrooms and water at this spot. The 25k and 50k group will be doing the same 8 mile route, then at the tail end the 50k group will add an additional 2 miles :) please carry plenty water. And so far we only received one hammer order request. Anyone else? Please share with us how your training week is going so far... And as a reminder please try to bring your race entry check on Sunday with your filled out application.